Furthermore, Scandinavia appealed to me the most out of all countries in this world. The average income is high, the level of education is unmatched, the inhabitants are known to be friendly and open to tourists, mooses might be hidden anywhere, and the facilities are excellent. Furthermore (but don't tell this to my friends, because they will think I'm even a bigger geek than they assumed) what I saw of Scandinavia reminded me of the sceneries I know too well from nightly Warcraft 2 sessions. I would perform a small genocide to get into that game, so any derivate is worth the effort of visiting. 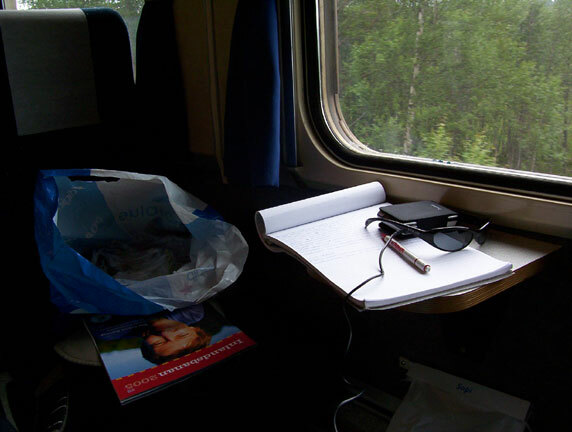 I therefore packed my backpack with clothes and magic mushrooms healthy sandwiches, bought an interrail ticket for the entire northern part of Europe, hid all my drugs and alcohol in the double bottom of my bag, and got onto the train that - through many transfers - would bring me to Helsingborg, Sweden. Before I left home, I made some unofficial appointments with four MadTracker users (that I got to know in via the MadTracker community) to visit them and use their facilities. Scandinavia - especially for a student - is extraordinary expensive, so some free places to get sleep, drink beer, wash clothes and make moves on their sisters meet their families sounded like a good plan. Furthermore, I was intrigued by the idea of meeting the persons behind the music and avatars. A rough schedule was therefore made, in which Magnus P&aring;lsson (SoulEye) in Helsingborg, Jens Wegar (Sunbuster) in Helsinki, Fr&oslash;de Tr&oslash;an (PyroZane) in Trondheim and Alexander St&oslash;ver (Bin&auml;rpilot) in Oslo would be visited. Nothing (except SoulEye, who would hook me up once I arrived in Sweden for the first time) was certain in advance, and everything was possible. The Conquest Of Scandinavia could begin!